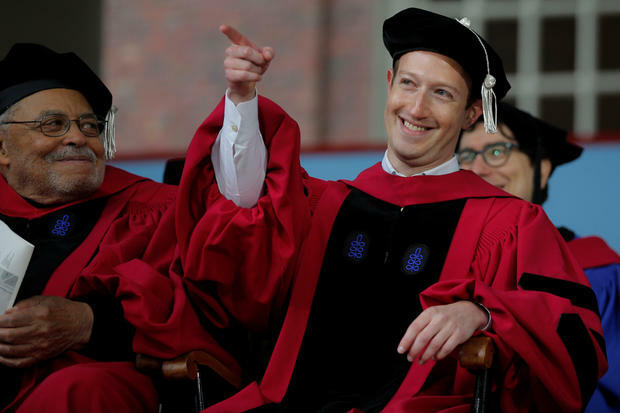 Facebook co-founder Mark Zuckerberg recently returned to Harvard University to deliver the 366th Commencement speech to an audience of more than 2,000. Throughout the speech Zuckerberg called on the graduates to “create a world where everyone has a sense of purpose.” He proposed three ways to accomplish this: “by taking on big meaningful projects together, by redefining equality so everyone has the freedom to pursue purpose, and by building community across the world.” The speech also touched on the 33 year-old’s experiences at Harvard, including his “best memory” – the rom-com-worthy story of meeting Priscilla Chan, the woman who would become his wife. In the speech Zuckerberg also brings up the fact that “ideas don’t come out fully formed,” and how movies and pop culture are propagating the “dangerous lie” of a “eureka moment”. “It makes us feel inadequate since we haven’t had ours. It prevents people with seeds of good ideas from getting started.” I highly recommend checking out the speech in its entirety. The speech, which was live-streamed on Facebook (of course), caused a minor Twitter-storm as viewers were treated to some hilariously garbled auto-captioning. (‘Facebook’ came out as ‘Ceceokok’. Zing!) Earlier in the day the Harvard Crimson was hacked, which was really more fanboy than troll, considering Zuckerberg’s own origin story. Prior to delivering the address, Zuckerberg was awarded an honorary Doctor of Laws degree from the university; which is going to look pretty slick on the ‘ol resume for when this whole Internet fad finally passes. And if that’s not cool enough for you, during the presentation of the honorary degree, Mark was sitting next to James Earl Jones (a.k.a. the voice of Darth Vader). Charmed life indeed.